If you were a small dog you would understand why they have anxiety, they are towered over by humans all day long. Not only are humans taller than them but in most cases they are stronger, which can be very intimidating. Some dogs may handle the anxiety better than others, but they will all have moments where they need the comfort and support of a human to get them through. Nervous urination- This can happen when they get so excited you are home. They lose control of their bladder and your kitchen floor is covered in pee. This isn’t always the most fun. 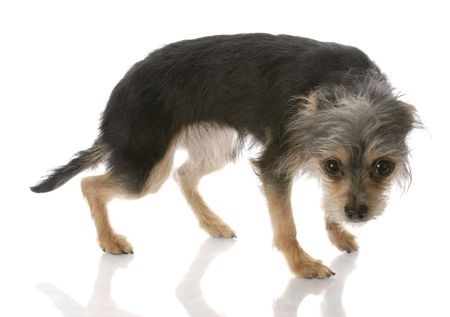 Trembling- Some dogs may shake when approached by people they do not know. Snapping or biting- This can be a dangerous reaction, when your pet feels threatened they will snap or bite at people. Pancaking- this is when your pet crouches down to their belly and crawls across the floor like an army crawl. Good news is most of these actions can be corrected without serious intervention. First thing to make sure is you do not yell at them for these actions, which will give them attention for bad behavior. Yes it is negative attention but it is still attention, instead go about your day as if nothing happened. Make sure you give your pet consistency. Do not change up routine on them; they will act out and you will be the one cleaning up the messes. If needed give your dog distractions. If your dog doesn’t like someone that came into the home, bring him into a different room and offer him a treat. Then he won’t feel anxious and the treat will let him know he isn’t in trouble. In serious situations there are medicines that can be prescribed by a vet to help your pet lead a normal life.